Titles are something writers struggle with almost as much as their prose. Sometime a fitting title comes easily, sweetly, encapsulating exactly what you want to convey. Other times, the lack of the right title leaves you wanting to pull your hair out. Titles and covers are how most readers choose a book. If you’re lucky, one or the other (or both), grabs your attention and reels a potential buyer in for a closer look. With so many books screaming for your attention, you need to find the title that will immediately hook a reader. Imagine yourself in Waterstones at a 3-for-2 table. If you saw Trimalchio in West Egg, O Lost or Tote the Weary Load would you have been tempted to pick them up? Probably not. These are the titles their authors originally called them. Much better as The Great Gatsby, Look Homeward, Angel and Gone With the Wind. 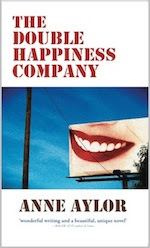 I’m very happy with the name of my new book, The Double Happiness Company. It’s a deliberately enigmatic one which a reader has to work at, but they may be intrigued enough to want to try. Not just happiness, but double happiness! Something that is even enshrined in the Declaration of Independence: “Life, Liberty and the pursuit of Happiness”. But the manuscript wasn’t always called that. For years, it had a half dozen working titles, only two of which I, cringing, care to reveal: Return to the Strange Land and Cage of Light. I can remember when the right title came to me one New Year’s Day several years ago. I saw an abandoned paper horn on the pavement. Intrigued, I picked it up and read that it had been made in Hong Kong by The Double Happiness Company. A eureka moment. I had my title at last. If you’re having trouble finding a name for one of your literary babies, don’t be tempted to resort to title generators when you’re stuck. While researching this blog I found a website which said, ‘Have you written a book, and have everything ready except for a great attention-grabbing title? Or perhaps you have writer’s block and need a title to get you started. Either way, the Instant Title Generator will save the day, as it gives you an automatic title that is sure to be a hit with potential publishers and the public alike!’ I tried it and one of the titles it came up with was The Devil and The President of the World. Underneath was the book’s suggested subtitle: Pizzas Are The #3 Men in Iraq. Hmmm, not something, I think, the buyers at Waterstones or Barnes & Noble will be rushing to stock. That title generating website is bizarre!